Hey, hey, Friends! We’re back from lunch. The chocolate cake was delicious. I’m sure the rest of the lunch was yummy, as well, but I was mostly here for the cake. And the cookies. Cake and cookies. Up on stage we have Greg Sterling moderating speakers Cindy Krum, Michael Martin, Bryson Meunier, and Matt Siltala. We’re gonna take a look at all those mobile apps we keep hearing about. Greg is guilting people into clapping and hollering really loudly. He’s pretty into it. Thank goodness for my sugar high. First up is Bryson Meunier. He says that apps do not mean the end of mobile search. Let’s just get that out of the way right now. You can optimize apps to become more visible in the app store. Android Market and other non-App Store app stores represent a significant opportunity for brands. Shazam Audio Recognition Advertising (SARA): They have a Wear The Pants campaign with Dockers. You put Shazam on the actual television commercial, you’re telling people to turn on Shazam and they play relevant advertising. Or something. I’m pretty sure I missed that. Feel free to school me in the comments. Google Mobile:You have to optimize mobile content for mobile queries because the mobile content is favored for mobile search results. Google Mobile Suggest: User may never see a search result, so optimize for Google Suggest. App development and local search optimization can help visibility in Suggest. Google Mobile: Voice Search: Natural language search queries and voice. Natural language search queries and voice necessitates long tail paid search execution. Google Goggles: Enable search history in Google Goggles. If your logo or product is not recognized, rate it to help Google return it correctly for others. Optimize your logos with “[Brand] Logo” and make sure they’re accessible to Image Search. Google Listen: Podcast search in beta app fills the iTunes void in Android. Create podcasts and optimize for “popular search queries”. Use relevant keywords in script, filename. Microsoft Tag/QR Code Search: Integrate QR codes into signage and print advertising. Display favorite place code, if eligible. It ties your offline to online. Mobile Web-Only Search: Submit to Taptu: touch-friendly Web search. Opportunity for small brands with mobile content. Up next is Michael Martin. 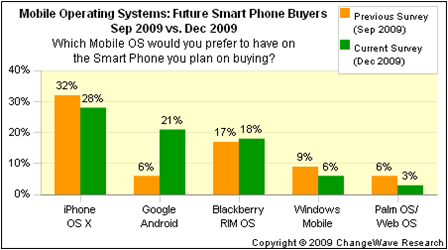 Why is Mobile Marketing important in 2010? The mobile phone is an extremely personal device. One mobile phone typically has one unique user, which makes it a precisely targeted communication channel. Mobile users are highly engaged with content which delivers excellent campaign effectiveness and response levels compared to other media. There are approximately 5 billion mobile phones, outnumbering TVs worldwide 3 to 1 and computers by almost 5 to 1, but only garnering it 1 percent of the current global advertising spend. There are 234 million mobile phone users in the US, about 20 percent are smart phones totaling over 45 million. This is almost DOUBLE a year ago. Mobile is now considered the 7th mass media channel after print, recordings, cinema, radio, TV and the Internet. It’s free and openly distributed. There are no licensing feeds. There’s no approval process for the Android Market. Users determine which apps should be removed by a rating system – approximately 1 percent of apps reviewed. Can be coded on Windows, Mac, & Linux operating systems. Can run multiple applications, Flash, onscreen widgets. Full speech to text recognition, image recognition, and soon speech-to-speech translations. Why Should I Care About Android As A Marketer? There are approximately 50 different types of Android phones available worldwide. That number will more than double by the end of 2010. They are already selling 60,00 a day/22 million a year. And I mean, that doesn’t even include all the phones Google keeps giving away. I mean… never mind. Michael says that the Android demographic now closely aligns with that of the iPhone. 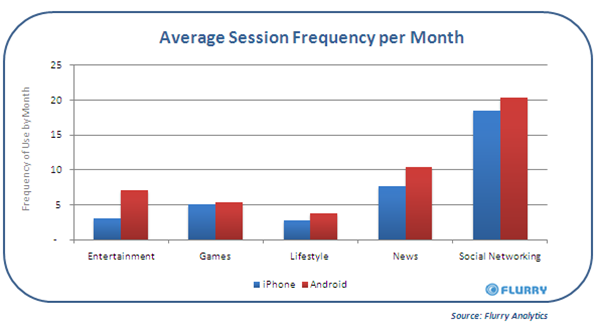 Android users are more frequent app users than iPhone users. The Android Market has a one time fee of $25 to submit as many applications as you want + Outside distribution means. The free market decides what stays. Android developers are easier to acquire & there are great tools like Appcelerator Titanium that allow for cross mobile development comparable to Adobe Air. Top grossing application trend is the freemium model grossing more with advertising than top selling paid apps. Next up is Matt Siltala. He’s asking questions and pulling out of a big bag of goodies. Someone won a T-shirt for having heard of the Yelp app. Ooo, I get a shirt for livblogging his session. Bribing livebloggers, FTW! I should make everyone give me gifts. Otherwise, they suffer THE WRATH OF THE LIVEBLOGGER! Muahaha! In January, Yelp received 29 million visitors. It’s more than just food reviews. Almost as many people review shopping as they do Restaurants… and you thought Yelp was just for finding a place to eat, huh? Be Found: Yelp allows you to search for businesses that are Nearby, if you’re not listed you’re not going to show up. Reputation Management: Read your reviews so that you know what’s out there about you. Yelp allows you to respond to reviews, as well. You also want to be proactive about making sure that your listing is correct. As the owner, you can leave your comments. Opportunities: Yelp allows you to “check in” to places (ala Princess FourSquare), as well. You can recognize the people who visit you. It gives you an opportunity to make someone say something about you by giving them something to talk about. You don’t have these opportunities unless you create your account. Sales/Business: When you create an account you can add your own photos. You can make sure your business information is correct. Creating a full Yelp listening can help you dominate the search results for your company name. It’ll give you a few extra spots that you can take up. You can go to biz.yelp.com and get a Business Owner Account. You can respond to reviews, get access to analytics, etc. I wrote about how to get the most out of Yelp and use all the neat features awhile back for SmallBizTrends. It may be useful if you’re a business owner creating a profile. There are lots of hidden gems on Yelp most business owners don’t know about. Next up is Cindy Krum. Augmented Reality is a physical, real world environment whose elemtents are merged with computer generated imagery. It’s done in real time and in semantic context with environment elements. Layar: It takes information from Wikipedia, Brightkite, etc, and aggregates the data into an augmented reality application. WikiTude: Uses the video camera on your phone. You point it at different things and it brings up the Wikipedia page related to what you’re looking at. You can point it at buildings in NYC and it will tell you what buildings you’re looking at. Google Maps: Take the camera on your phone and it will show you different things as you move your camera phone. It will map it, get driving directions, etc. It also creates a more interactive experience to help close the loop between on and offline. The biggest potential winners: local shops, social networks, travel, real estate, restaurants, malls. How do you have your data included in an AR application? Find the apps that reach your audience. Figure out how they get their results. Is it a direct pull, daisy chain, paid submission, free submission? You want to optimize all your feeds and make them as easily parsable as possible. Use site maps to make it even more accessible. Augmented behavior is really trackable. It can help you analyze conversion triggers and understand post-conversion behavior. She thinks all that is going to become relevant soon. Bryson: depends on the client. There are some clients that are about branding or more geared to youth marketing. It’s great for extending your reach. If you’re talking to a smaller business but is looking more for ROI, you can still sell it through but you have to approach it differently. It can still be valuable. It’s probably an audience that you’re not reaching now. Given how competitive the economy is right now, a lot of people are looking for an advantage. Why build an app rather than a mobile web site? Michael: It’s resident on the OS. Cindy: You want to be cross promoting between your app and the Web site.